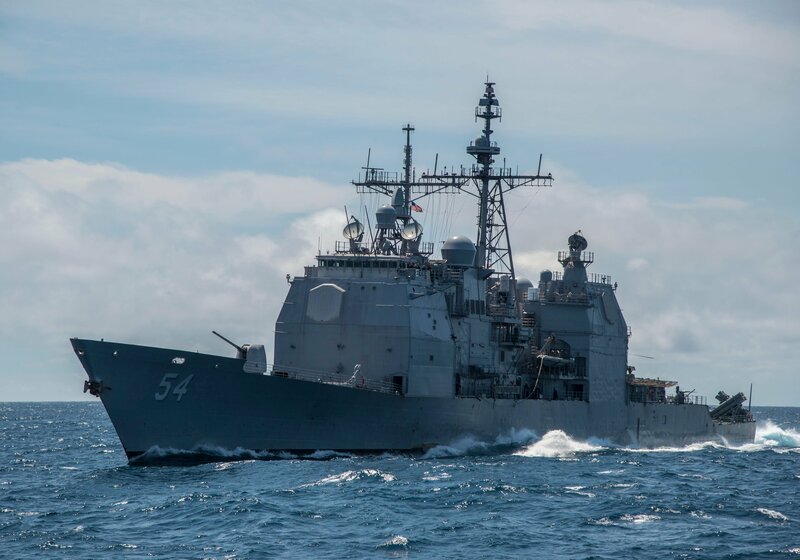 The Ticonderoga-class cruiser USS Antietam (CG-54) ran aground on Tuesday in Tokyo Bay resulting in an oil spill, two Navy officials confirmed USNI News. The ship – part of the Navy’s forward deployed forces – was in the process of anchoring in the bay when it ran aground and damaged its props. Antietam was unable to maneuver on its own and was brought back to into port with tugs. “There were no injuries to U.S. or Japanese personnel. The incident did result in the discharge of hydraulic oil into the water,” read a statement from U.S. Pacific Fleet provided to USNI News. One official told USNI News that the cruiser lost hundreds of gallons of oil. “The Navy is cooperating with the Government of Japan and Japanese Coast Guard in response to this issue and is taking appropriate measures to minimize impacts to the environment,” read the statement. The following is the Jan. 31, 2017 statement on Antietam’s grounding. YOKOSUKA, Japan (NNS) – On January 31 Japan time, the Ticonderoga-class guided-missile cruiser, USS Antietam (CG 54), damaged the ship’s propellers while anchoring in Tokyo Bay. An investigation is underway to assess the full extent of the damage.